Students share stories from internships that were about a lot more than getting coffee. Over the summer, I was lucky enough to get an internship with Quicken Loans in Detroit, Mich. To say that it was amazing would be an understatement. The quality of life there blew my mind. I never thought that a mortgage lending company could be so fun. The first thing you notice when you walk into the Quicken building are the colors. Bright reds, blues, and greens decorate the floors, ceilings, and walls. The next thing you notice are the cubicles. Instead of boxes with tall walls that make you feel like a hamster in a cage, the walls are low so that you can see everyone. And instead of name tags, each person’s desk has a large cut out of hir face. When I arrived, a Nerf Gun fight was happening in the corner of the room while other team members (their name for employees) were handling calls with clients. But that’s not even the best part. They have slushie machines on every floor of the building, with flavors that rotate between lemonade, Cola, and even Red Bull. What a time to be alive! Aside from the company culture, the internship was pretty standard. I did a lot of data entry and scheduling, along with taking some calls from clients, but what I really loved about the experience was their attention towards improving the image of Detroit. They hosted bus tours for the interns to see the city; there were also events to plant trees and clean up blighted neighborhoods. It’s no secret that Detroit has had some hard times in the past 50 years—don’t even get me started on the sports teams—but it’s amazing how much Quicken Loans has been doing to try to change the city’s image. Dan Gilbert, the founder of Quicken Loans, has invested a ton of money in Detroit, including installing security cameras all around the Downtown area, building a parking garage that doubles as an international art museum (the Z-Lot), and hiring artist Shepard Fairey to paint a huge mural on the side of the company’s headquarters. I loved spending time in the Downtown part of Detroit, and it was fantastic to watch the city have life breathed back into it. What an awesome internship! This summer I worked at Weill Cornell Medical College (WCMC) on the Upper East Side of Manhattan. I was interning with an Associate Professor of Public Health and Medicine in the Healthcare Policy and Research Department. My focus was the complex systems science applied to emergency care and hospital preparedness. I was responsible for generating descriptive statistics, developing research hypotheses, and conducting literature reviews. I also created a draft publication on hospital preparedness exercises to improve responses to health-related emergencies. For the project on hospital preparedness, I was responsible for researching the different entities that help hospitals plan, conduct, and evaluate exercises related to emergencies. In order to be efficient, hospitals must be capable of functioning effectively under stress, whether it’s in the form of an unexpected surge in patient arrivals, a blackout, or any other disruption of normal operations. The other project I worked on was about ambulance response times. We analyzed data collected during the months before Hurricane Sandy, during Hurricane Sandy, and after Hurricane Sandy. This data included when ambulances left to pick up the patient, departed the scene of injury, and arrived at the hospital. We studied how these data points changed over time, when inefficiencies occurred, and possible methods to ensure that these issues did not occur again. My 10-week summer internship at NY1 News in New York City was an exciting and inspiring experience. I worked on a program called “One on 1” with Budd Mishkin, which identifies interesting or influential New Yorkers and profiles their lives and careers. I also staffed the general News Desk, answered phones, and assisted with various shoots on location, including Governor Cuomo’s speech on police force reform in New York State. Additionally, I conducted background research on each new person who appeared on the show, which helped inform the scope and direction of the interviews. Because of the diverse array of subjects we profiled, from comedian Colin Quinn to politician Charles Rangel, I was able to work out of my comfort zone. One great aspect of working on “One on 1” was that Mr. Mishkin and his producer Maggie Margolis really made me feel like a part of the team. They listened to my suggestions, offered me opportunities to collaborate with the rest of the team, and assigned me intellectually stimulating tasks. On the ride over to each interview, Mr. Mishkin would consult me about questions and topics to engage the subject with, while on the ride back he would ask me what I found most compelling about the interview we had just conducted. There were really no negative aspects to my experience at NY1; everything from working in Chelsea Market to Mr. Mishkin and Ms. Margolis’ kindness made the experience a pleasure. I enjoyed working in a fast-paced professional environment, especially one filled with young people willing to think outside the box and respond to new challenges creatively. 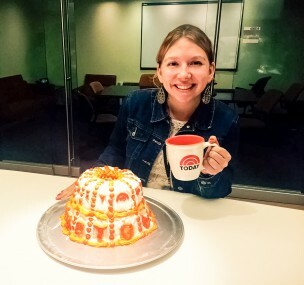 This summer I interned at the Parents section of TODAY.com, the website for NBC’s Today Show. In addition to writing articles for the site, I managed the TODAY Parents Twitter account, answered emails from our community of bloggers, and helped cover social media for our Friday morning concerts. One of the best parts of the internship was the amount of control I had over what I wrote. Over half of the articles I published on the site were based on ideas I had pitched over email or in our daily editorial meeting, and I was able to a cover a wide variety of topics, from postpartum depression in men to standup comedian moms and science toys for girls. Not to mention that I was allowed to film an entire Snapchat story for the Today Show account about adoptable puppies and kittens! I also loved being part of broadcast television, which made our office environment a lot more fun than a typical newsroom. Since we often wrote up segments from the show or from funny YouTube videos, you could always hear people laughing or exclaiming from across the cubicles. Additionally, there was a constant stream of food, makeup, and other products from shoots left on the “freebie table,” and one time the entire floor was treated to Starbucks coffee and pastries. Another highlight of my NBC experience was attending the BlogHer15 conference. Because our primary goal was to recruit new bloggers, my boss encouraged me to livetweet all of the keynote speakers, including director of “Selma” and “Scandal” Ava DuVernay, actress Gwyneth Paltrow, and documentarian Christy Turlington Burns. By far the most wonderful part of my internship, however, was the friendliness of the entire staff. My editor was approachable and always appreciative, even sending out a praise-filled public thank-you email when she wasn’t able to make it for my last day of work. It’s hard for me to put into words how fantastic an experience it was to work at TODAY.com… so instead, I baked them a cake! When I got a summer job in Editorial at Random House, I imagined sitting in a reclining chair with a pencil behind my ear, poring over great literary works and discussing character development with Alice Munro. Of course, this isn’t quite what happened. As an intern, I spent most of my time sorting what’s known as “slush,” or unsolicited manuscripts that arrive at a publisher without a literary agent’s referral. After reading through so many slush submissions, I felt like I was getting a glimpse into the collective human mind. Some samples had me contemplating my faith in humanity, but others came along to remind me—albeit through awkward sentence structure and mediocre grammar—that there were still thoughtful, imaginative writers out there. Halfway through my internship, I was asked to fill in for an editorial assistant. While in that position, I was fortunate enough to play a small role in the editing process of a book being published. This experience was a great reminder of why I wanted to work with books this summer, as I watched other book-lovers discuss a great piece of writing with passion and intelligence and work to turn it into the best version of itself. So, my insider advice for aspiring writers is this: publishing houses really do care about you and your work (but if you don’t have an agent they’ll put it in the slush pile and make their interns read it, so try to get an agent). Those of you thinking about working in editorial: a career in publishing is a great choice if you’re looking to be around a community of smart people who love to talk about words. Plus, there are giant shelves with a constant flow of free books that you can take. Need I say more?